Illustrated Type artwork has been flowing into the gallery, and let me tell you, opening these packages is like Christmas morning, but WAY better. Lots of bubble wrap and lots of consistently amazing pieces. 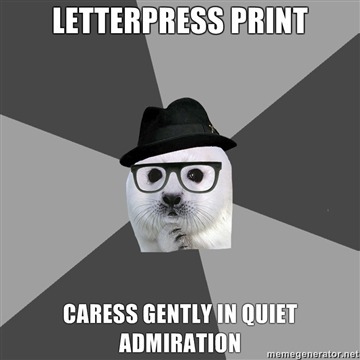 This design seal meme perfectly captures my reaction upon unwrapping Studio On Fire’s posters. Based in Minneapolis, MN, Studio On Fire provides both design services and letterpress printing with a distinctively tactile presence. Their unique workspace marries design, art and craft. They say it’s like having cream and sugar in your coffee, and I couldn’t agree more. I’m ecstatic to share their contribution to Illustrated Type! An exquisite letter press poster featuring refined, geometric type paired with raw, organic textures. This piece encompasses some of Studio On Fire’s favorite things—posters, fluorescents, thick paper (which feels SO good, you guys! ), split fountain printing, and a wise quote (brought to us by Alphonse de Lamartine). On opening night, we’re releasing 30 of these beauties! Image from Studio On Fire. Jared Andrew Schorr’s preview letters have been getting lots of positive feedback on Twitter and Facebook, and it's only right for them to garner some more love here on the Nucleus blog. Aren’t the colors great? Enjoy these paper cut space adventures! And we’ve got 2 more where this came from! Images from Jared's Twitter account. Eric Smith has designed for Element Skateboards, HOW Magazine, and even Myspace, but what really got my attention is his ‘Live Now’ Project. We are a growing collection of friends, powerfully pursuing the notion of 'living now'. We're spreading our message through artwork, literature, relationships, exhibitions and more. This movement cannot be confined, is spilling out, and making history. The 'Live Now' book (now available!) is a catalog of over 100 inspirational quotes and illustrations from collaborators all over the world. AND all pages are perforated, so get ready to clear some wall space/spread the sunshine! I was extremely touched by Eric’s story and message, and am SO happy that he agreed to be a part of Illustrated Type. Below are his three beautiful posters, "crafted with smiles"! Thanks so much for taking the time to send over some process photos, Eric! Can’t wait for everyone to see your posters in person! Images from Eric's Flickr account. Back from a twelve-day blogging hiatus with an exciting announcement! If you’ve perused the Illustrated Type event page within the last week, you may have noticed that the legendary artist and designer ED FELLA was added to the roster! A show celebrating hand drawn and experimental typography without one of its trailblazers just doesn’t seem right, so we’re ecstatic and honored that Ed has agreed to participate! Be sure to read Vince Carducci’s beautiful piece on AIGA’s website—it does more justice to Ed and his work than anything I could ever type into this blog post! And of course, visit Ed Fella’s truly compelling online portfolio. Art For Japan Auction Now Live! The bidding continues now through this Sunday at 7pm (PST). Placing bids on your favorite pieces adds art to your life while helping others. The artwork that you win will be a reminder of the donation you made to Give2Asia's Japan Earthquake & Tsunami relief. 100% of proceeds go to the Give2Asia fund. Thanks for your support! This sweet lil' drawing by Dreamworks artist Aurian Redson will be up for grabs in this Saturday's Scissorhands 20th and Adventure Time opening reception raffle. Drawings at 10PM! Additional tickets can be purchased for $2.00 each. Winning tickets announced via Facebook and Twitter! Another Illustrated Type sneak peek! Here's some great process work from Darren Booth, an illustrator and typographer based in Canada. I can already tell that this painting is going to be really, really lovely! Aren't familiar with Darren's work? Scroll down for a sampling of his portfolio (Daiiy Drop Cap contribution, book cover, and divine ampersand), but be sure to visit his website for more! And for your daily dose of "typography, illustration, and design peppered with sarcasm, quips and old man-like ramblings," follow Darren on Twitter (@darbooth)! The 3D Type Book by FL@33 from Tomi Vollauschek on Vimeo. This is the third book conceived, compiled, written, and designed by Agathe Jacquillat and Tomi Vollauschek at London-based design studio FL@33. The 3D Type Book features more than 300 projects by 160+ emerging talents and established individuals and studios. Keep your eyes peeled for Happycentro, an Italian design studio slash powerhouse—also contributing to Illustrated Type!—when the book drops on the 20th. Join us for art and good company on Saturday April 23rd at 6:00pm to 10:00pm with some light refreshments. For each of you who donate $10, you will be given two button templates to design and make your own pins! Thank you everyone! Looking forward to seeing you then! This Illustrated Type sneak peek comes to us from Christine Nguyen, done in collaboration with Michael Wysong. This is a detail shot of 10 x 10 ft SCULPTURE! The letters will be made from branches of crystallized lichen and moss. Here are some examples of Christine's past projects, many of which are highly experimental. Powers of the Cosmic Dusty Seas, 60 x 504 inches, c-prints, 2011. Nest, 15 x 20 inches, cyanotype and salt crystals on paper, 2010. Aren't they stunning?! On May 14th, come prepared to have your mind blown! In the meantime, check out Christine's beautiful mixed media on mylar pieces from our 2008 Line Weight show. Images from Christine Nguyen's website. "Just in the way that I'm inspired by books and magazines of all kinds, conversations I have, movies, so I also think, when I put visual work out there into the mass media, work that is interesting, unusual, intriguing, work that maybe opens up that sense of inquiry in the mind, that I'm seeding the imagination of the populace. And you just never know who is going to take something from that and turn it into something else, because inspiration is cross-pollinating. So a piece of mine may inspire a playwright or a novelist or a scientist, and that in turn may be the seed that inspires a doctor or a philanthropist or a babysitter. And this isn't something that you can quantify or track or measure. And we tend to undervalue things in society that we can't measure. But I really believe that a fully operating, rich society needs these seeds coming from all directions and all disciplines in order to keep the gears of inspiration and imagination flowing and cycling and growing. So that's why I do what I do, and why I spend so much time and effort on it, and why I work in the commercial, public sphere, as opposed to the isolated, private sphere of fine art. Because I want as many people as possible to see my work, notice it, be drawn into it, and be able to take something from it." Fun fact: Marian designed our Girl Show flier in 2005!